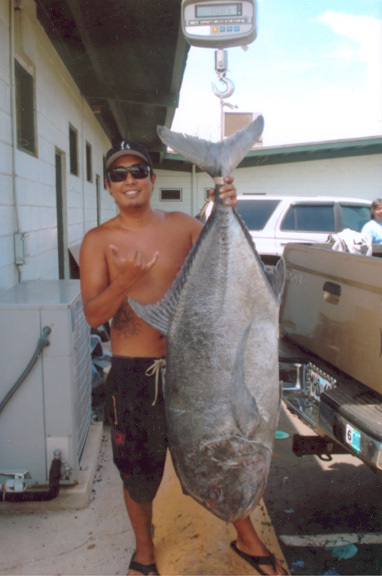 Ikaika Wong celebrated his birthday a week earlier by catching a 45-lb ulua then, a week later at the same spot, he caught his dream fish, this 106.5-lb ulua. Ikaika and his friend Grant were surprised to find Makena devoid of fishermen when they arrived but were joined by two other casters later. The extra help came in handy when Ikaika landed his monster ulua using a 13-foot Outcast Slider pole, Newell 550 reel and 80-lb test Suffix line.